Writing and Marketing: What is Website Optimization and the SERP? I’m sure there are hundreds and hundreds (maybe even more) of definitions of website optimization. To put it in its simplest form, think of a light bulb. The bulb is created – it exists – it has the potential to bring much needed light. But, if that bulb doesn’t have electricity powering it, it won’t work. It won’t light. This is true of your website. Almost every website has SEO (search engine optimization) features. These features allow you to create keywords, titles, subtitles, categories, content, webpages, optimized images and video, and so on. Consider these features the power to your website – the electricity. All those features, when created properly and working together, give the search engines tidbits of information to grab onto. The search engines take that information and determine what your website is about, what it’s offering, and if it’s a quality site. The search engines use that information to categorize and index your site. I’ll use Google as the catch-all for search engines. Once Google has you categorized and indexed, it can then use your website content (usually blog posts) as the results of an internet searcher’s query. Let's use one of my posts as an example. 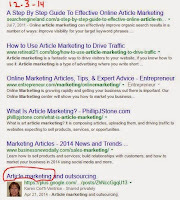 If a person decides she wants to know about “article marketing,” she’ll put that keyword in Google’s search box. In seconds, Google scours its millions and millions of tidbits of information to find the best fit for that query (search). 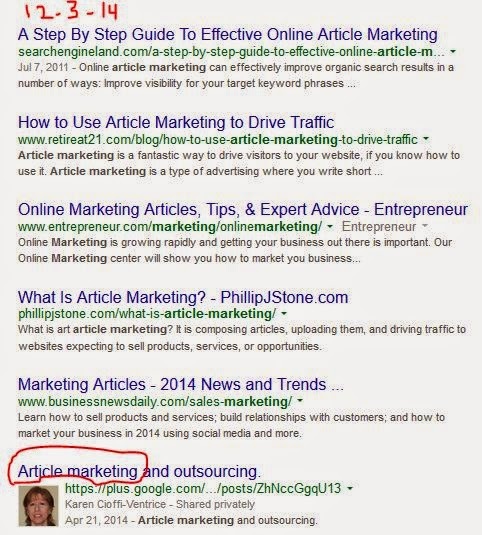 If you’ve been content marketing right, you may very well be on one of Google’s first SERPs (search results page). There are a couple of reasons how I was able to get on page one, but that’s for another topic. This is why optimization is SOOOOOOO very important. Being on a search engine’s results page is what will help bring traffic to your site, build authority, and boost lead generation (potential clients/customers to your website). SERP is an acronym for ‘search engine results page.’ This is the page a search engine will send a person (a searcher) to when he enters a search keyword or term in the search box. Ideally, you’d like to be on page one of the results. This may not always be realistic, so getting on page two or three is next best. After page two or three, your chances of being found through a search results are slim to none. Most people stop looking at results at page two or three. I know I do. How do you get onto the SERP? This is where search engines come in. Search engines have spiders that crawl (search) content. The content they crawl includes domain names, website titles, subtitles, pages titles, post headings, categories, tags, content, and even images on WordPress sites. Every little nook and cranny in your website is searchable by these bots. If your website’s focus is freelance writing, hopefully you have content within the elements mentioned above that makes it clear your site is about freelance writing. The spiders find keywords or terminology within your content, which it uses to categorize and index your site. Then, when someone does a search for that keyword the search engine can connect your site to it and provide your link. This of course is if you’re providing quality content and following Google’s rules. Do You Still Need a Website as the Core of Your Online Platform?